This Grandmother's Garden: November GBBD...I guess I'm in! November GBBD...I guess I'm in! Woke up early this morning, just couldn't sleep. Began to read a few blogs. 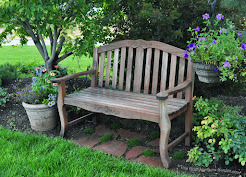 Didn't take long to realize, it's Garden Bloggers Bloom Day. 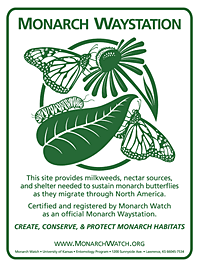 Carol at May Dreams Garden graciously hosts this event on the 15th of each month. though I've always enjoyed reading the posts of some of you that do. "Why not jump in?" my muse whispered as she peeked out from the closet. "Of all the months to join ... are you serious? In November?" This is the view from my window this morning. Bloom Day... and it's snowing in my gardens. "That could be a snow blossom, couldn't it?" My muse can be a persistent little creature. "Fine", I thought to myself. "Let's go for a walk... in the snow... to see what's blooming in my gardens for Bloom Day." "Yippee! But walk slowly and don't slip! You already have a crack in your tailbone." 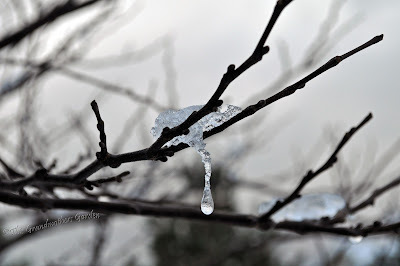 More than once I wondered what I was doing out there in the cold and slippery snow. Thoughts of insanity loomed near. The shades of purple blooms are especially enchanting to me. planting each step firmly before moving on. Sometimes it helps to say it aloud. Another purple bloom caught my eye! 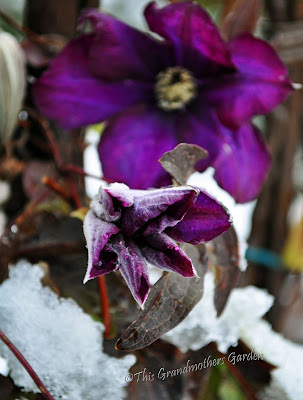 to discover this beautiful clematis was reblooming. 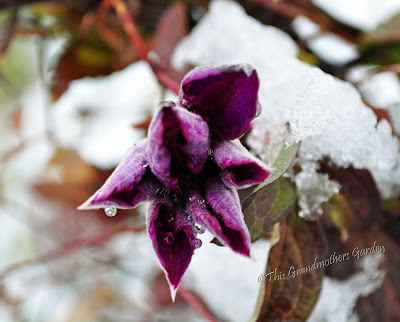 I don't ever recall Fall blooms from this clematis in my gardens. 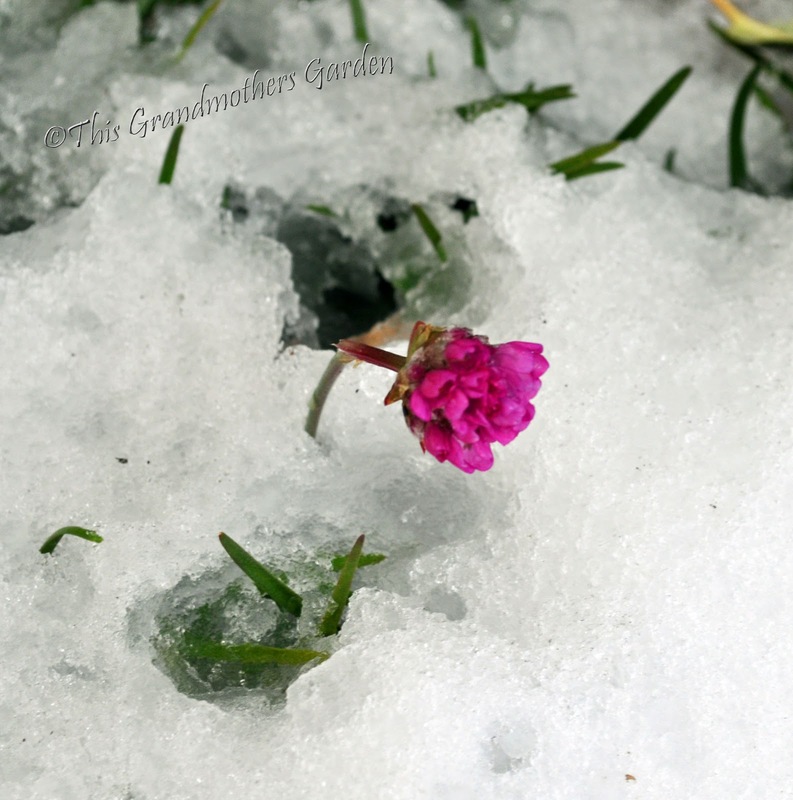 and open those snow covered petals to bloom. I left a few zinnias in my perennial garden to provide seed for the birds. 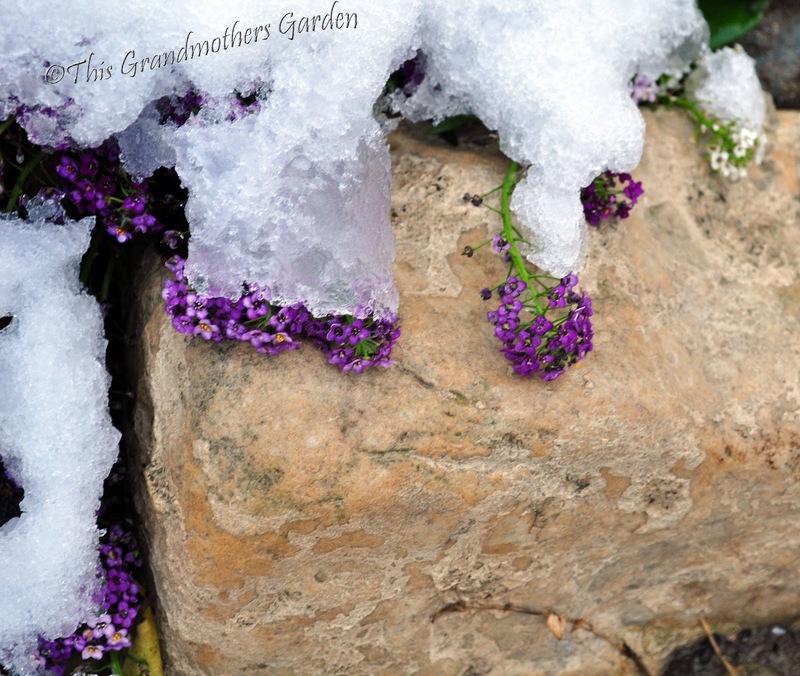 my garden has been snowed upon this season. Looks like it took a snowball to the face. I thought they were through blooming weeks ago! Each time it warms up a bit, another bud begins to open up. turn into delightful seed-heads in the Fall that seem to be a bloom all of their own. a rather nice contrast peeking out from the snow. That is not dew sitting on those petals,it is liquid snow. This rose is a survivor. it is somewhat protected from the cold winds and frost. Will it live a few more days to open? and for the morning adventure! And thank you Carol for hosting! in my gardens come December? Oh Meredehuit! Yours is my favorite for GGBD so far! The first photo of the Sweet Allysum took my breath away. 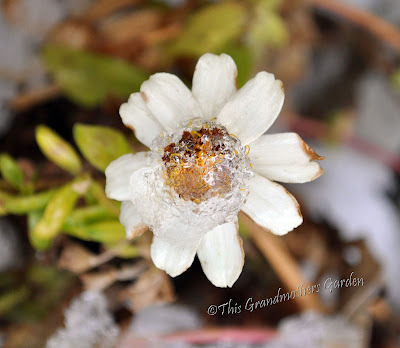 I literally LOL at the zinnia with the snowball to the face! Oh and the Sea Thrift in the frozen sea, so lovely! Thank you for taking us on your walk and Happy 1st Garden Blogger Bloom Day to you! 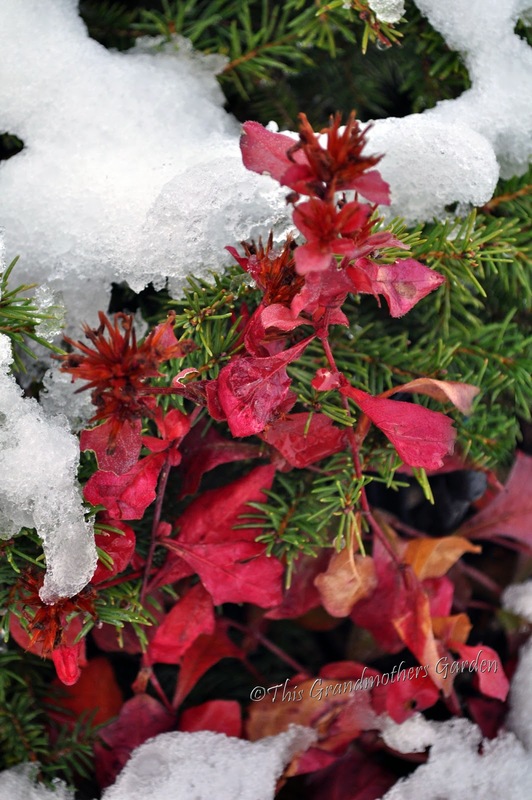 Well your muse was right because your blooms were pretty even in the snow. 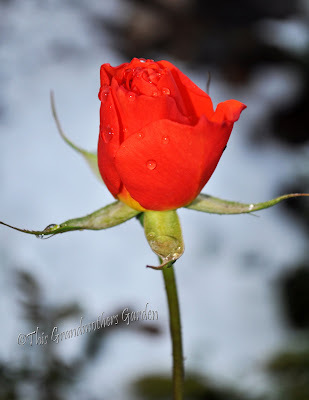 My roses keep surprising me also with a bloom or two and I will take them and enjoy them this time of the year.I cannot believe the snow already.We have lucked out so far but our luck cannot last too much longer. Have a wonderful week. I want to personally thank your muse for encouraging you to participate this GBBD. 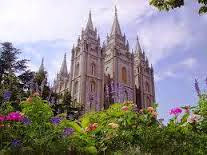 You photos are beautiful. 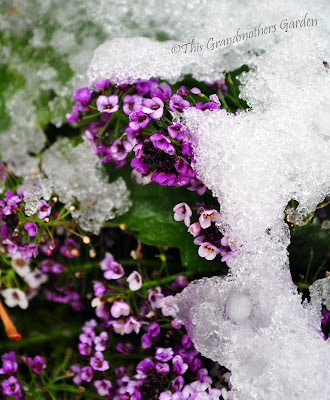 The snow on the flowers is so much an image of opposites. I was actually praying for frost or snow for this bloom day, and alas, none was to come my way. i wanted to capture the snow gently melting in the sun to reveal the flowers. You did a great job. Love this post, story and images. Your pictures are just beautiful. You have quite a bit of snow too--I'm still snow free. Love the shots of the snow and the Sweet Alyssum - what a contrast! Such a variety of gardening environments out there. Please thank your muse from me too. What beautiful photos. I was enchanted each time I looked at them ... and I kept going back to look again. 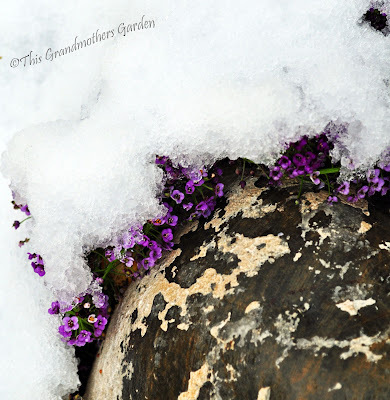 The tiny flowers of the sweet allysum peeking out under the snow were probably my favourite. I didn't know blooms could survive the cold at all. They look so fragile against the snow. That was fun! 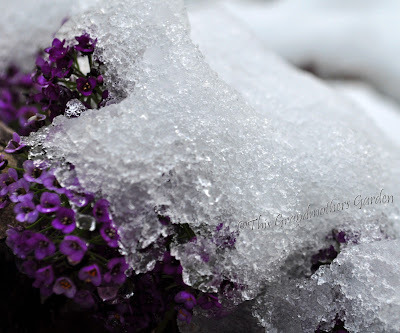 It was like a treasure hunt in the snow, discovering the hidden jewels of blooms. It was a great adventure, dear Meredehuit! November bloomday is so precious for us living on the nothern hemisphere with temperate continental climate. Especially if we can find flowers under the snow. Yours are beautiful - snacks of a deep frozen summer. Amazing, Carolyn! Your muse knew what she was doing, all right. I'm amazed at the fortitude of those lovely blossoms. My favorites are those gorgeous purple sweet Alysum blossoms and the sweet red rose without a name. Wow! Those are some tough blooms! That snow made for some amazing photography! Beautiful pics today! I do think they will rival any on this meme today. Have to say your plumbago pic puzzled me, as I had never in all my days seen a plumbago turn its leaves red. So I googled, and there we go...I learned about a new plant today...the hardy plumbago! So cool! What a garden you have still blooming in the snow; how pretty. I also love your rocks, too! I hope your injury is healing well. And be careful on the slippery surfaces! 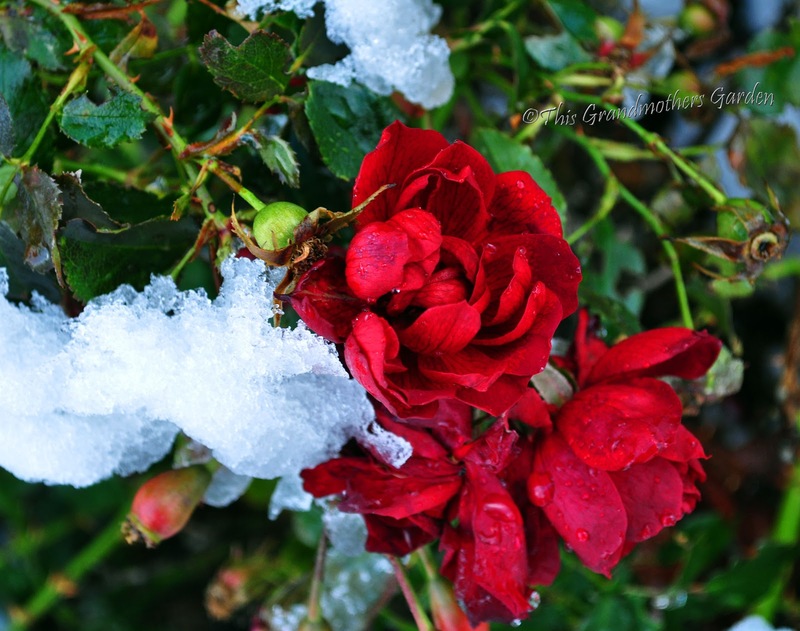 Even though its snowing, your garden still has blooms to show us! Happy Blooms Day! I'm so glad your muse encouraged you to join in! Such beautiful photos of the blooms with their snow icing. Snow in my part of the country is so infrequent that everything stops when it falls. All the children go out to play in it - many of the adults, too. My husband and I especially careful these days when going out. A few years ago he slipped on icy steps and broke his shoulder. Beautiful photos, they look like they belong in a fairie tale story book. Isn't bloom day fun! Though i must admit I'm a bit shocked you already have snow. Temps are still in the 70s here, though a dusting of snow in the hills is forecast for the weekend. 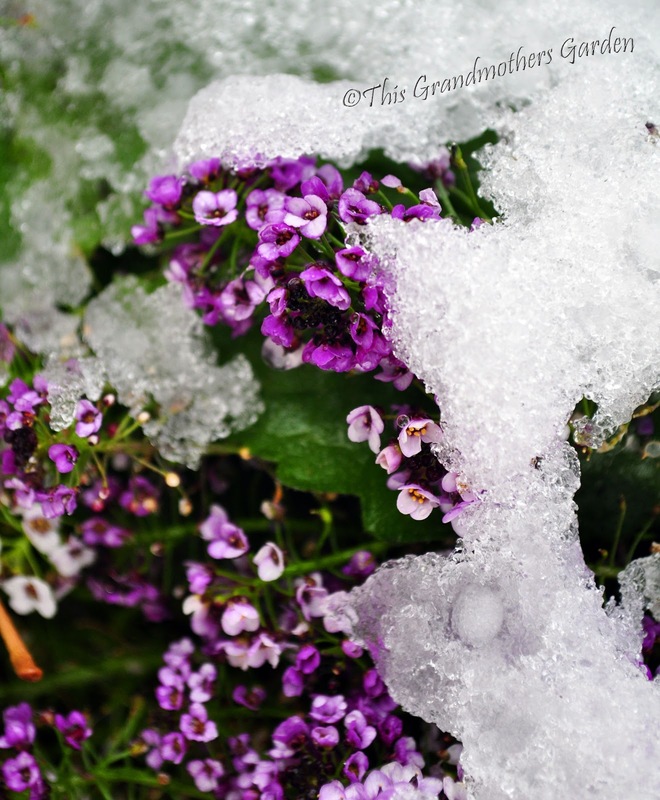 I can't believe you have snow already but your photos with the flowers peeking through are simply stunning. Beautiful post! Superb photos. Little treasures of colour covered by snow. Beautiful.